Saturday saw a clash of styles more opposed than the ‘Beauty and the Beast’ encounter with Stoke. 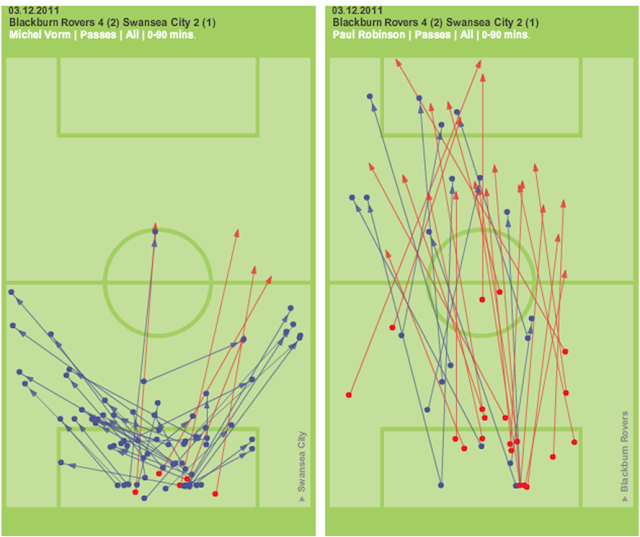 Swansea made almost 400 more passes than Blackburn (with only 1 more unsuccessful pass), making 752 Passes compared to Blackburn’s 355. Swansea made only 5 interceptions in the whole game (and 3 of these were in the last 10 minutes) compared to 28 from Blackburn, but of course it’s difficult to intercept a ball that’s 20ft in the air. The chalkboards of the two keepers help highlight the different approach with Vorm passing short and Robinson launch everything goalbounds (and almost scoring on one occasion). 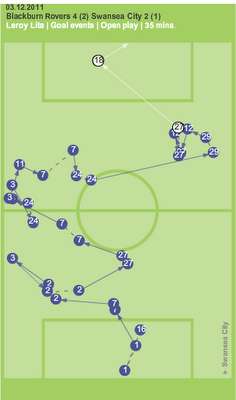 Only 1 of Robinson's 33 passes was to someone in his own half. 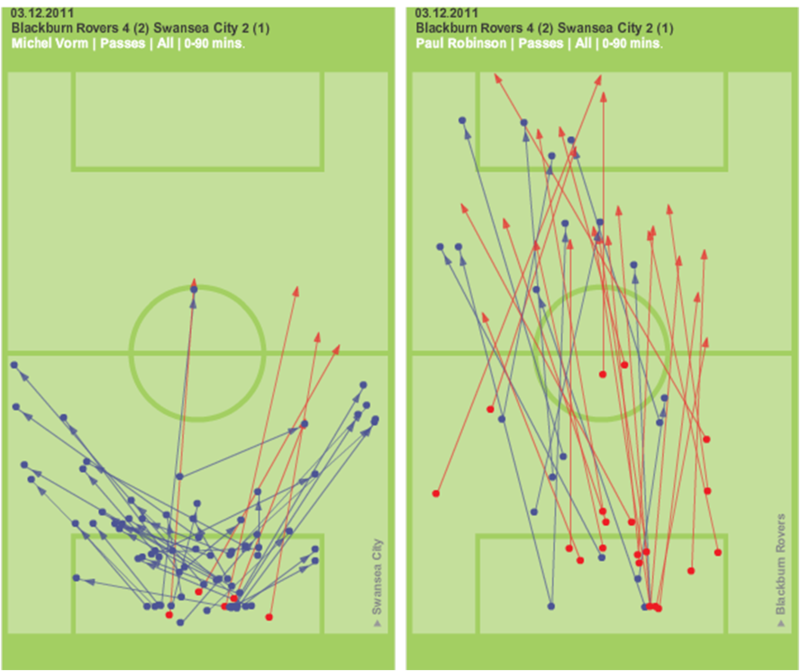 Blue lines, Successful Passes. Red Unsuccessful. 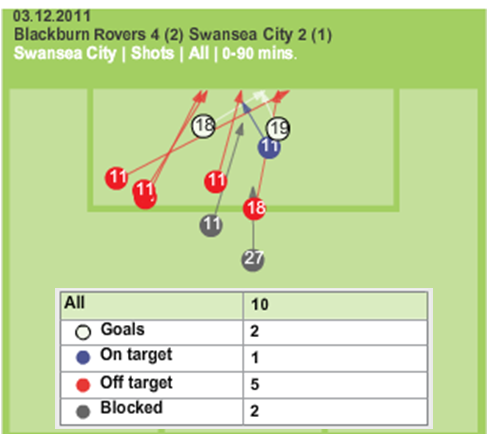 Blackburn’s four goals would suggest their strategy of ‘getting it in the mixer’ paid dividends but in reality this threat was dealt with relatively well by the Swans defence, aside from the two corners that led to Blackburn’s second and third goals. 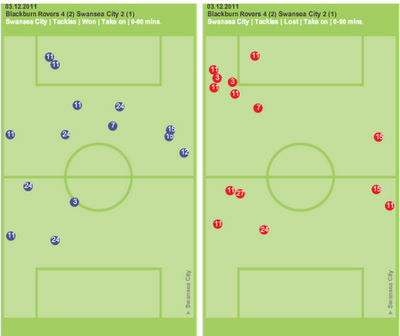 Blackburn’s second goal in particular was galling especially as Richards had appeared to do the hard work of getting himself between the Blackburn player and the ball and it looked a relatively straightforward job of shepherding the ball out for a goal kick. It seemed that Jazz went for the safety first option of putting the ball out for a corner but as I mentioned in the Villa review it may be that not being an established first team player Jazz’s decisions get extra scrutiny. In terms of shots, the Swans again only just hit double figures with 6 of the 10 efforts on goal coming from Scott Sinclair who is coming in for increasing criticism on the message boards some of which is justified. I personally think that he spent too much time off his wing when he didn’t have the ball especially when Moore came on. Sinclair made a total of zero crosses in the match, compared to Routledge’s three in 45 minutes for example but ultimately he brings a sufficient goal threat to be kept in the side. The images showing ‘Take On’s’ below for example show Sinclair having 5 Successful and 7 Unsuccessful attempted Take On’s compared to 2 Successful and 2 Unsuccessful for Routledge and just 1 Successful for Dyer. Maybe things didn’t come off for Sinclair but it wasn’t through lack of effort. Blackburn’s first was well worked with an excellent finish, but their others were in one way or another very disappointing from a Swansea viewpoint and as long as the mistakes are learnt from have to just be put down to it being a bad day. Swansea’s first from Lita was a perfect example of the value of sticking to our style. 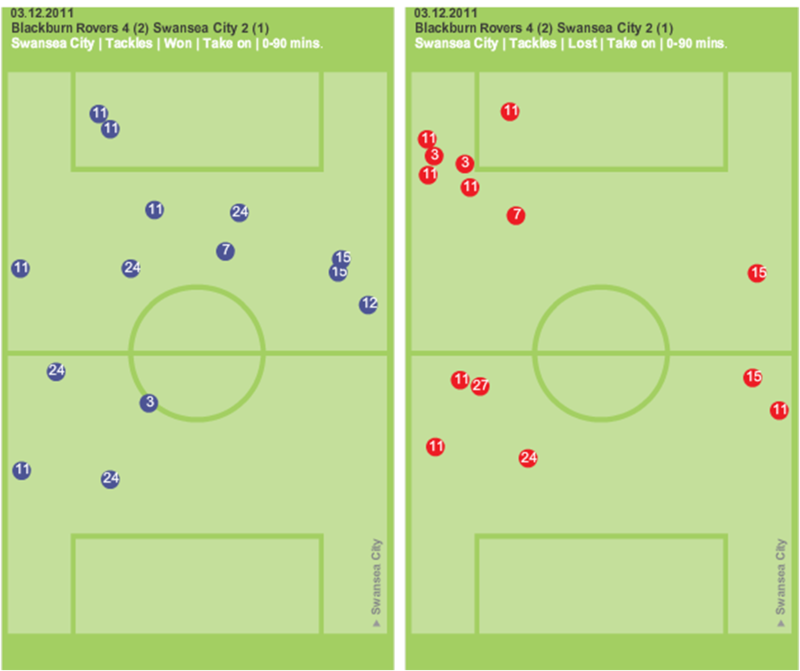 From the chalkboard the thing that stands out is the repeated appearance of number 7 (Leon Britton) who was fascinating to watch all game with the way he was constantly moving without the ball, changing the angles available to be able to receive the ball at any time. I’d rather us playing entertaining football in the championship rather than doing whatever it takes just to stay up. The were large scale chants of ‘Kean out’ even when the Blackburn were 4-2 up and the match was coming to an end. They’d rather vent their frustrations on the regime than actually enjoying the win and coming off the bottom of the table. Obviously the hope is to play entertaining football and stay up, we’re averaging a point a game so far and are only two points from ninth although also only four points off the relegation zone. Whichever side of the dotted relegation line we end up it’s likely to be only a few points either way so it’s a case of keeping the faith even if the next few weeks see a wobble occurring.